The Huron River system flows through the southeast Michigan counties of Oakland, Ingham, Livingston, Washtenaw, Monroe and Wayne. The mainstream originates in Big Lake and the Huron Swamp northwest of Pontiac and flows roughly 125 miles to its mouth in the marshlands of Pt. Mouilee on Lake Erie. 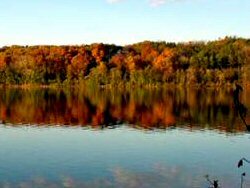 The Huron River is a highly accessible river and is a favorite getaway for families throughout the Detroit metropolitan area. It winds through expensive lakeside developments of northwestern Oakland County and peaceful farm country around the villages of Hamburg, Dexter, the campus of the University of Michigan in Ann Arbor, to the busy industrial communities downriver from Detroit. The river still has a rural feel despite its proximity to numerous small towns and larger cities.